February 2012 issue of the American magazine, Vintage Guitar. 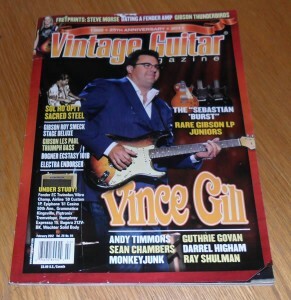 Each issue has a variety of articles about vintage and old guitars, guitar collecting, interviews, news and lots more. Featured in this issue are Vince Gill, rare Gibson Les Paul Juniors, dating a Fender amp and many other articles and features. The magazine is in good condition, with some marking and wear to the cover and corners (see photo).